These installation shots in Poster Museum at Wilanów were provided by Podpunkt, the excellent studio which designed the show and the accompanying book. They were photographed by Michał Drabik. Podpunkt did much more than design the show: they worked closely with me to shape its conceptualisation. Much of the intellectual drive of the show comes from Podpunkt’s design. The show was controversial. 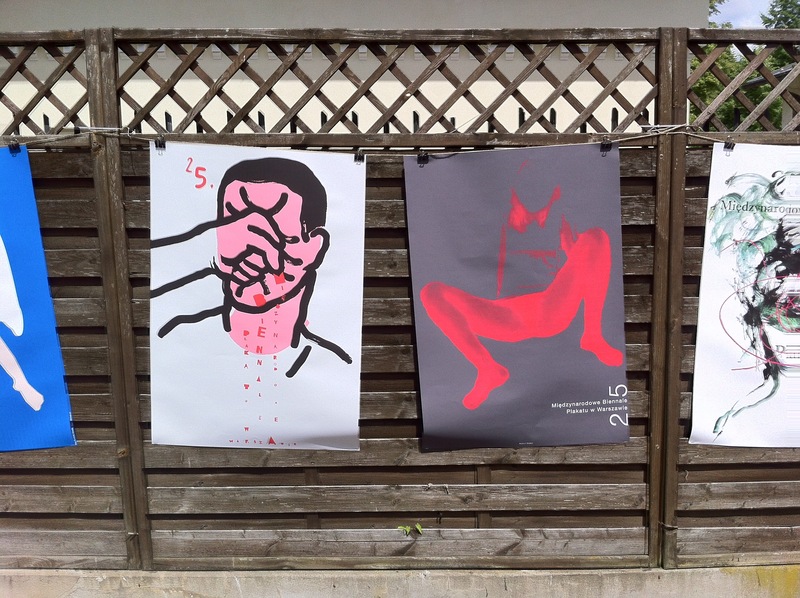 Some designers felt that it undermines the tradition of the Polish poster – perhaps it does. My intention was not to treat posters as works of art (in the traditional sense) but to explore the relationship of this historic form to other media – to cinema, television, print media and of course the Internet. Some of the most striking works in the show are by unknown designers. So in this sense, the highly artistic and authorial tradition of the poster was abandoned, at least for the duration of the show. A large number of critics also wrote a letter to the Minister of Culture, Piotr Gliński, demanding the reinstatement of the traditional Biennale competition (an open call for designers to submit posters – whether they were commissioned works or simply propositions for posters) and describing the decision to change the format and appoint me a ‘scandal’. You can hear the arguments being rehearsed on Polish radio here. During the opening of the show, there was a protest against the concept of the exhibition. Ten or maybe twelve painted posters were hung in the courtyard which divides the two pavilions housing the show. Here are two of them – you can judge their merits. If you read Polish, there are some thoughtful reviews and previews in Polityka, dwutygodnik (a typically excellent and critical piece by Karol Sienkiewicz), Gazeta Wyborcza and Rzeczpospolita. The last(!) print issue of 2+3D magazine also includes an interview with me, an editorial on the Biennale and a feature on the work of Jordan Seiler and Vermibus, two artist who feature in the show. There is also an image-led piece the summer 2016 issue of Eye.